During its more than 125 years of existence, Monsieur Jules Elie has made as many fans as adversaries. It’s not the easiest peony variety to grow. This peony has stems that are often too slight to carry the huge flowers, opens very soon making it difficult to cut successfully and suffers easily from sooty mould. But it is a true veteran that, thanks to its huge flowers and beautiful colour, has a lot of admirers. A pink dream! 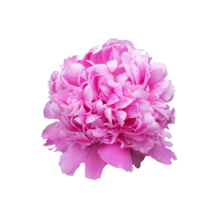 This peony variety was bred in 1888 in France by Crousse. We’ve never found any information about Monsieur Jules Elie himself, but we’re convinced that his name will continue to live on for a very long time. Monsieur Jules Elie does not impress in the bud stage, but will develop huge flowers when mature. Preferably use a vase with a high neck to support the thin stems or use them in a bouquet.